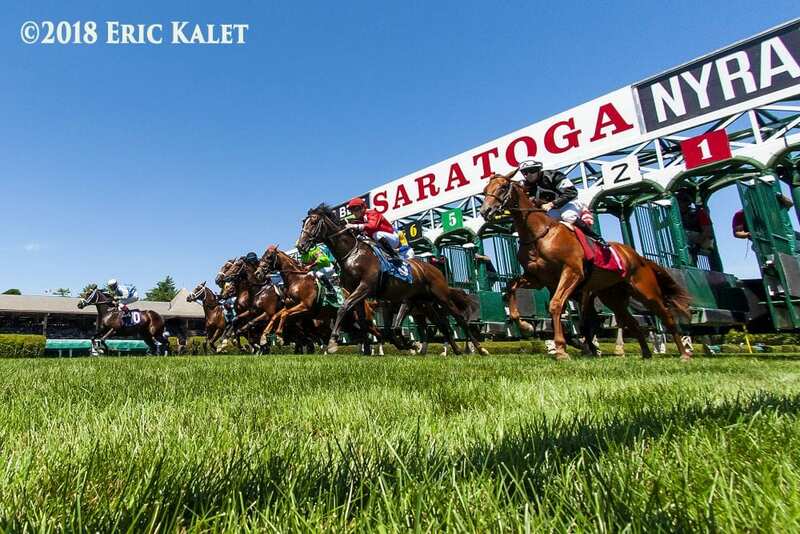 More than 100 New York-bred horses will have the spotlight at Saratoga Race Course to themselves on Friday when the historic upstate track hosts New York Showcase Day, featuring six stakes worth $1.25 million exclusively for horses bred in the Empire State. The stakes action commences in Race 3 on the 11-race card with the $250,000 Albany for 3-year-olds going 1 1/8 miles. Renewing their rivalry are the first three finishers in the New York Derby on July 21, with the Christophe Clement-trained Sea Foam looking to maintain his edge over runner-up Spectacular Kid and beaten favorite Analyze the Odds, winner of the Mike Lee on May 28 at Belmont. Also in the mix is Evaluator, who will be making his second start off a two-month layoff, having missed by a half-length in an optional claimer over a sloppy track on July 23 at the Spa. The Michael Dilger trainee, who began his career on turf, won the Sleepy Hollow as a 2-year-old, and was nosed out by Empire Line in the Damon Runyon to start his 3-year-old campaign. Trainer Todd Pletcher, known for his success at the Spa with 2-year-olds, sends out Barry Schwartz's homebred La Fuerza in the $200,000 Funny Cide at 6 ½ furlongs. The Flatter colt opened his career with a 7 ¾-length maiden score onJune 22 at Belmont and followed that with a 4 ½-length tally in the Rockville Centre on July 14. Squaring off against him in the seven-horse field will be a trio with victories at Saratoga already on their resumes: the Steve Asmussen-trained Bankit, a winner on July 27; Dugout, who scored on July 23 for trainer Larry Rivelli, and Gary Contessa trainee Bustin to Be Loved, who won first time out on August 6. Contessa comes back two races later to saddle Maiden Beauty in the $200,000 Seeking the Ante for 2-year-old fillies, also at 6 ½ furlongs. The Revolutionary filly took the restricted Lynbrook in her first outing, rallying from sixth over a sloppy Belmont track to win by 3 ½ lengths. Among those challenging her are the Ken McPeek-trained Time Warp, who was a $230,000 purchase last year at the Fasig-Tipton Saratoga sales. The Cairo Prince miss was no factor in his first start on July 25 after brushing the gate, but came back on August 8 for a front-running win in a seven-furlong off-the-turf event. Also entered are maiden winners Party Like Grandma, Icy Maiden, Collegeville Girl, Awesome Debate, and She's Trouble. Turf fillies and mares are up next, with graded stakes winner Fifty Five heading a field of nine for the $150,000 Yaddo at 1 1/16 miles on the inner turf course. The 4-year-old Chad Brown trainee has been first, second or third in 12 of her 13 career starts, most recently taking a one-mile optional claimer over a yielding Belmont course on July 15. Returning to state-bred company as well is Repole Stable's Overnegotiate, making her first start of the year. The Overdriven filly, winner of four of her 13 starts, arrived from Palm Beach Downs in late July and has posted three works, most recently going a half-mile in :49 on the main track. Among those also entered are La Moneda, who carries a three-race win streak into her first stakes appearance; Mount Vernon winner Feeling Bossy, and Lady Joan, who is 2-2-1 from six Saratoga starts. The Albany's sister race, the $200,000 Fleet Indian, has attracted the Linda Rice-trained Split Time, winner of the New York Oaks at Finger Lakes in her most recent start. The daughter of Take Charge Indy has won five of her last six starts, with her only blemish a third-place finish tine Bouwerie on May 28 at Belmont. Among her chief rivals is expected to be English Soul, the East View winner who was the beaten favorite in the Oaks and also finished second in the Bouwerie. Wrapping up the day's stakes is the $150,000 West Point presented by Trustco Bank at 1 1/16 miles on the inner turf. State-bred stalwarts and millionaires King Kreesa, who won the race in 2014 and 2016, and Kharafa, both 9, meet for the umpteenth time, with stakes winners Offering Plan, Tapitation, Mo Maverick and Black Tide among their rivals. This entry was posted in Bloodstock and tagged albany stakes, New York breeding, New York Showcase Day, new york-bred, saratoga, todd pletcher by NYRA Press Office. Bookmark the permalink.